Heute wird Leszek Balcerowicz der “Milton Friedman Prize for Advancing Liberty” verliehen. Wem die Leistungen meines langjährigen Freundes nicht mehr gegenwärtig sind, dem helfe ich gerne mit dem Verweis: im Falle von Balcerowicz sagt ein Bild mehr als tausend Worte. Ehe wir zu dem Bild kommen: etwas Hintergrund: Im Jahr der europäische Wende 1989 wurde Balcerowicz Finanzminister und stellvertretender Premierminister von Polen in Osteuropas erster nichtkommunistischer Regierung seit dem Zweiten Weltkrieg. Balcerowicz hielt diesen Posten bis 1991, und wieder von 1997 bis 2000. Im Jahr 2001 wurde er Präsident der polnischen Nationalbank, wo er bis 2007 blieb. Balcerowicz verinnerlichte die “fünf P”: “prior preparation prevents poor performance” – und war deshalb 1989 für seine Aufgabe gut vorbereitet. Tatsächlich konnte er bei Amtsantritt sein umfassendes Liberalisierungs- und Transformationsprogramm für die polnische Wirtschaft aus der Schublade holen und das verwirklichen, was danach als „Big Bang“ bekannt wurde. Und wie man so sagt: der Rest ist Geschichte. Die Ergebnisse des “Big Bang” sprechen für sich selbst im folgenden Chart. Polens Wirtschaftsleistung hat sich seit dem Untergang der Sowjetunion weit mehr als verdoppelt – mit durchschnittlichen jährlichen Wachstumsraten von 4.42%. Wie ging es derweil dem Nachbarland Ukraine? Der Unterschied zu Balcerowiczs Polen könnte kaum deutlicher sein. Wie Oleh Havrylyshyn, der ehemalige stellvertretende Finanzminister der Ukraine inseinem Buch “Divergent Paths in Post-Communist Transformation: Capitalism for All or Capitalism for the Few” darlegt, lehnte man in der Ukraine “Big Bang“ und konsequent marktwirtschaftliche Reformen ab. Damit ging die Ukraine den Weg ins Niemandsland und blieb im Schatten eines korrupten kommunistischen Systems. Im Gegensatz zu Polens Wohlstandsentwicklung erfuhr die Ukraine einen post-sowjetischen Niedergang ihrer Wirtschaft. Tatsächlich ist die ukrainische Wirtschaft seit dem Untergang der Sowjetunion mit einer realen Jahresrate von beinahe einem Prozent geschrumpft. In realer Wertschöpfung ist die Ukraine heute ärmer als 1992. Viele denken, dass der Internationale Währungsfonds, der gerade 17 Milliarden $ für die Ukraine zur Verfügung gestellt hat, diese Entwicklung umkehren könnte. Aber das dürfte ein frommer Wunsch sein. Schon seit Jahren gibt der IWF Kredit an die Ukraine – mit eher negativen Ergebnissen. Wenn es um die bitter benötigten Wirtschaftsreformen geht, muss man Großes und Mutiges tun; etwas, das Unternehmer motiviert und Bürger unterstützen. Leider fehlt es der Ukraine auch genau daran: einem klaren Reformplan, der weitreichende Unterstützung der Bevölkerung findet. Steve H. Hanke ist Professor of Applied Economics an der Johns Hopkins University, Baltimore. Ukraine and Poland are not comparable re their resp. potential for growth. That doesnot mean that 'Polish' style of reforms couldnot do much good for the country. 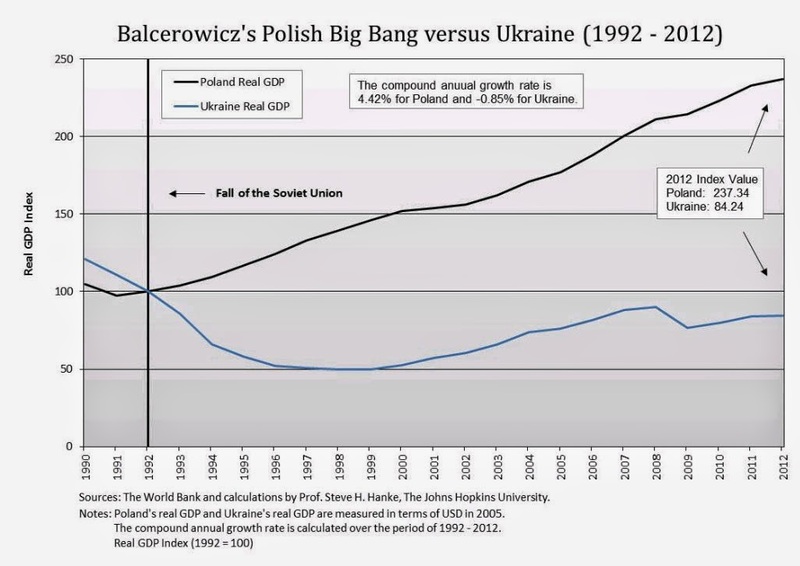 However it simply will not be able to replicate the Polish growth since roughly 1990 not even close. 1. Poland is a real country it has a national identity. Borders might be a bit weird in several ways because of the WWs, but the majority of the people feel Polish. There is also a sustainable platform to look West, unlike in the Ukraine. These things provided the political climate which made it possible to introduce most of the measures on which the Polish success is based. And not only the business side. It also was a large part of the foundation on which the country could work on governance. Which has simply enormously improved since 'independence'. Better governance was also important as a basis on which the business reforms could flourish. 2.EU. As said there was a sustainable platform to look West. And from the other side a platform to make Poland asap a full EU member. from the East there was little pressure to avoid all this. All totally different from the Ukraine. Not really welcome in the EU and because the link EU-NATO and further integration into defence by the EU a no go for Russia. On top of all that it is Germany's neighbour and therefor an ideal basis for outsourcing (well educated, cheap workers with industrial experience, close by and one of the first, at the time when the South became rather expensive for outsourcing). 3. Timing. Poland's growth can for a substantial part be explained by being there at the right time. Biggest nett receiver EU funds. Which was helpful as well. On of the first on the market and in a time that outsourcing really took off. Europe doing relatively well and so did the worldeconomy (well as far as growth is concerned at least). 1. It never was/is a real country. Which doesnot have to be a real problem if there is a consensus to cooperate. However there never was. Social the country is divided in 2 parts and as a consequence thereof politically as well. Which might not even be such a big problem if the political groups can agree upon a modus for power (and likely wealth) sharing. However all this was not possible. In fact the measures to give the country a national identity did partly the opposite as it was a national identity with which large groups didnot feel comfortable. Because of the political stalemate and the 'natural' corruption the situation is that because there is effectively no rule of law reform will only partly work. The country is Europe's Nigeria corruptionwise with no sign of improvement on top of that. 2EU. A no go. Hard to see that there is a majority in any nett paying EUcountry for EU membership. And there is not one to transfer major funds to the country as well in some other form. If it has to happen it will be another big negative for the politicians that approved it. Same way Russia will start making trouble as will most of the East as now. Which will not create any climate in which governance can be substantially improved (like now). Basically there is a considerable oversupply now of cheap labour in the EU especially in the East. Logistics with Poland were relatively easy (except some stolen trucks), with the Ukraine to NW Europe is likely as expensive as from China (same problem as Greece has now btw and unlike Poland). Europe slow growth for the next decade at least if there is any growth at all and the worldeconomy doesnot look really rosy as well. 3. Timing. Lousy timing economy wise but also outsourcing wise. 4. First a modus to stabilise the country politically should be found. Which will be hard. Since especially Odessa may be even impossible. Anyway likely worth the try to federate the country before it breaks apart. The groups simply find it basically impossible to live with each other. It is federation or bust most likely. Modus to cooperate with the EU as well as Russia without breaking the relations with the other partner. Means probably all military and securuity stuff out of the association agreement. Get rid of Yats and Ms Yulia simply unacceptable for the East. The dodgy president is already eliminated. Kick asap the Neo Nazis out of everything government related. 'Putin' the oligarchs (now they are a taking care for no 1) political force and on top of that they are basically assetstrippers not investors. No ordinary businesssector the way they came to power is simply semi-Mafia at best. The oligarchs in the Western camp are as bad or even worse as the ones East. The chocolate guy looks a lot better, however he needs a proper PR agent. Quickly alienating the East (and if this one is spoilt it is country over). 5. Putin. Putin wants a bufferstate simple as that. Form is probably not that important. The above set up is probably acceptable for him. However warmongering on other fronts like the Baltics is a complicating factor. Completely useless as well. If Russia goes in there, they cannot be defended unless with nukes or permanently putting 100ks troops there. All completely unrealistic and will be seen as agressive as well and cause a counterreaction. Anyway if Putin goes in it will be in the form of an extended civil war (unlike the West in this crisis, Putin is not a complete idiot). Doubtful NATO will pick that up and start shooting at locals. Anyway rather weird that permanent peace between France and Germany should be replaced by permanent tension between EU and Russia. hardly an improvement I would say. This is btw an article/OP that looks better suited for a blog. I personally like it but I am the world's worst reference for these kind of things. Clearly in the UK and certainly in the US it would be. Hard to see that Germany is that much different, more not used to it (as I see it). Writing is more stiff in Germany and texts are longer in general (and the public is therefor more used to it as well of course). But at the end of the day people in the internet age are not that much different. Personally I like the format of your sisterorganisation better simply communicates better on 'puters'. Or have a look at the stuff in eg Forbes your colleague Raoul is writing. Complicated technical stuff presented in a relatively short and relatively easy way. Or have a look at Sober Look. They have usually excellent easy to grasp technical OPs (slightly different topic, but that is not that important). I have it myself as well as said. Except for the language too academic and the different subtopics are often not properly integrated/connected to communicate well. Simply would cost me 5 times the effort or so it simply isnot worth it for me. I can get to a result but I am not a natural it is all techniques picked up along the way, so it simply takes a lot of time to do it. However for writing a blog it is different. And my experience is that after 2 or 3 months a new style becomes natural and anyway you pay a lot of attention to detail clearly. Comments like mine are 15 minutes or so max typing which is clearly different from writing a post. Probably would make the OPs also better suited to publish subsequently in a paper. And of course not all subject matters can be made simple. But may be a cut on parts might help for those in a lot of these cases. Keep up the good work. Really most of it is excellent stuff.